The objects contain antennas that reflect surrounding WiFi signals. Researchers at the University of Washington have developed a way for 3D-printed plastic objects to transmit information via WiFi without the help of batteries or electronics. And they show that it can be done with commercially available plastics and WiFi receivers. "Our goal was to create something that just comes out of your 3D printer at home and can send useful information to other devices," Vikram Iyer, a graduate student on the project, said in a statement. "But the big challenge is how do you communicate wirelessly with WiFi using only plastic? That's something that no one has been able to do before." To do this, the team used things like 3D-printed springs, gears and switches that could be used to translate motion into antenna-transmitted information. For example, they created an anemometer, which measures wind speed, and attached it to a gear. When the gear spins, the teeth connect with an antenna embedded into the object and that antenna then reflects ambient WiFi signal, which can be decoded by a WiFi receiver. The faster the wind, the faster the gear spins and the more rapidly those signals are transmitted. They also created a scale and a flowmeter that can measure water speed. Additionally, they printed three widgets -- a button, a knob and a slider -- that work in similar ways and can be used to talk to other smart devices. 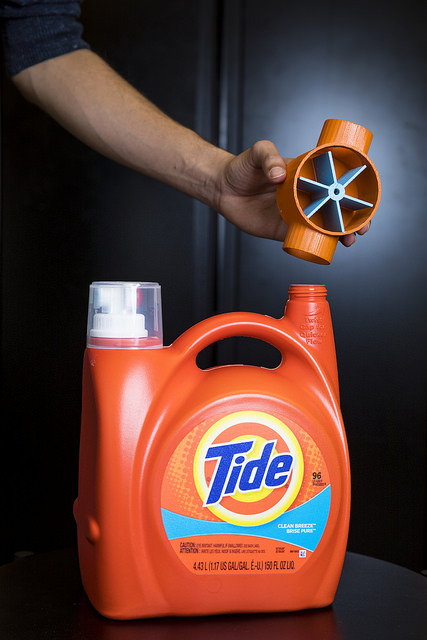 The researchers also developed two smart objects -- a detergent bottle with an attached flowmeter that can track the amount of remaining detergent and order it when it gets low and a test tube holder that can be used to measure the amount of liquid test tubes contain and track inventory. And lastly, they developed a way to print iron into 3D objects in distinct patterns, which when read by a magnetometer in a smartphone, for instance, can be used to convey important information about that object such as what it is, who made it or how a robot is meant to interact with it. "It looks like a regular 3D-printed object but there's invisible information inside that can be read with your smartphone," said Justin Chan, another student on the project. The team is making their 3D models available to the public so that anyone can utilize these objects at home. The work was recently presented at the Association for Computing Machinery's SIGGRAPH Conference and Exhibition on Computer Graphics and Interactive Techniques in Asia and you can check out a video about the work below.